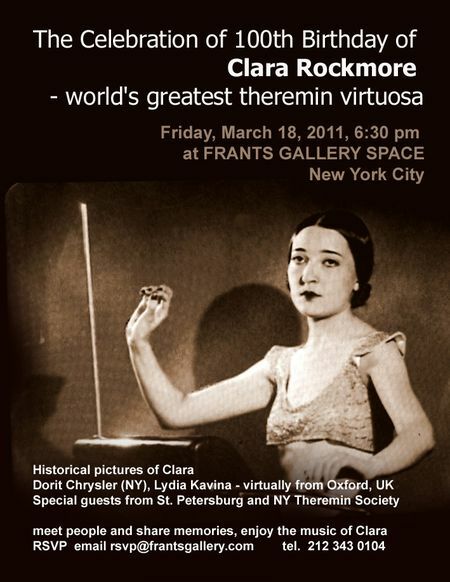 The Celebration of 100th Birthday of Clara Rockmore – world’s greatest theremin virtuosa. Historical pictures of Clara, video demonstrations. Discussion: “Rockmore’s playing technique. Traditions, present, perspectives” with: Clara Rockmore Foundation, Members of Clara’s family, Albert Glinsky – author of “Theremin, Ether Music and Espionage”, Olivia Mattis – the organizer of the First International Theremin Festival, Dorit Chrysler (NY), Lydia Kavina – LIVE ON LINE from Oxford, UK. Special guests from St. Petersburg (Bob Kitlyar and Sergey Teterin) and NY Theremin Society. Meet people and share memories, enjoy the music of Clara Rockmore.